The Student Conduct and Capacity Committee looks set to consider the case against the Knights of the Campanile following the Junior Dean’s dismissal of hazing allegations. The Junior Dean, Tim Trimble, ended the investigation into the Knights of the Campanile earlier this month, stating he “found only that an unauthorized party was convened in [Ben Arrowsmith’s, Knights of the Campanile President] apartment on 27th February” in emails seen by Trinity News. The Junior Dean confirmed to Arrowsmith on April 5 that he had “not reopened this investigation”. The role of the Student Conduct and Capacity Committee is to “to hear, determine and resolve certain cases relating to student conduct and capacity,” as outlined in the College statutes. The committee comprises the College Registrar, or a nominee of the Registrar, and twenty additional members. Members are to consist “so far as possible of eight members of the academic staff, four undergraduate students, four graduate students, and four members of the technical, administrative and support staff”. Any given hearing may include seven members of the committee, with a quorum of five, of which at least one must be a student. The investigation emerged following an article published by the University Times entitled “Knights of the Campanile Implicated in On-Campus Hazing Evening” which alleged that “groaning, gagging, and retching sounds” came from the apartment where the Knights were gathering and that members were told to “bend over” and “get in the shower”. The article received backlash from students after its publication, which detailed that UT reporters stood outside Arrowsmith’s apartment in House 37 where they heard “shouted instructions,” before placing a recording device outside the apartment door and waiting upstairs “out of sight for over an hour and a half”. The Knights denied that any “humiliation and/or bullying” took place during the evening in a letter signed by the society’s Master, Peter Ledbetter. The letter criticised UT’s reporting methods as having “disturbing implications for the privacy rights of all students in College”. “Telling someone to bend over for instance, they’re painting it in a completely, I’m not going to say irrelevant, but decontextualised light insofar as that was one particularly tall guy being asked to bend over when he was putting on a bike helmet,” he said. 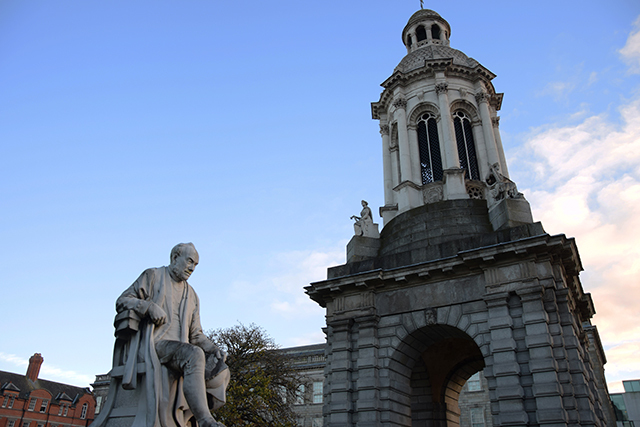 Today is the last day of voting in a referendum to dramatically decrease UT’s funding, after Trinity College Dublin Students’ Union (TCDSU) received 500 signatures, the necessary number to trigger a referendum. If the referendum passes, the UT Editor’s salary and accommodation is set to be cut, while the union’s funding for the newspaper would be reduced to €3,000 a year. Additionally, the campaign alleged it had “been been made aware of a number of cynical, misleading messages circulating within WhatsApp groups in relation to this referendum”. The campaign pointed to “messages state that this referendum will put UT’s funding on a par with that of TN [Trinity News]” and outlined these were “not true”. Trinity News received €11,728 towards print costs for the 2017/18 academic year, alongside accommodation for the editor which amounts to approximately €8,000 each year.